Rep. 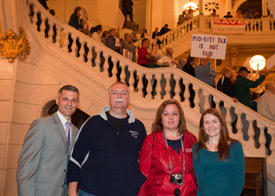 Rob Kauffman welcomed Chambersburg residents (from left to right) Tim Moran, Barb Moran and Michele Jansen to the state Capitol where they joined the rally to support the Property Tax Independence Act, which would allow for the complete elimination of school property taxes. HARRISBURG – State Rep. Rob Kauffman (R-Cumberland/Franklin) today joined more than 25 colleagues in the House of Representatives at a rally in the state Capitol Rotunda to support the Property Tax Independence Act, which would allow for the complete elimination of school property taxes. “Property taxes are an unfair and archaic system of taxation that needs to be eliminated and replaced with a commonsense and equitable tax system, which is what House Bill 1776 is designed to do,” said Kauffman. “The Property Tax Independence Act takes the onus of financing public school education off homeowners and, instead, spreads it out to all taxpayers by being based on a person’s ability to pay. Specifically, the Property Tax Independence Act (House Bill 1776) would provide the same level of funding for schools across the Commonwealth as they currently receive through school property taxes. The bill would enhance collections through the state’s personal income tax by raising it from 3.07 percent to 4 percent. It also would generate additional funds by closing loopholes in the state sales tax and raising the rate from 6 percent to 7 percent. The plan would apply the 7 percent sales tax to clothing and footwear that cost $50 or more, non-prescription drugs and food items that are not part of the Women, Infants, and Children (WIC) program. Lawmakers in attendance at the rally also signed the Pennsylvania Declaration of Property Tax Independence, a document vowing to do everything within their power to replace the current property tax system by enacting House Bill 1776. For additional information about the Property Tax Independence Act, including a complete list of items that would be subject to the expanded state sales tax, constituents should visit www.RepKauffman.com and click on the “Property Tax Independence Act: Get the Details” banner link at the top of the page.